Start off your visit on the 14th (Thu): don't miss a visit to The Embarcadero, head off the coast to Alcatraz Island, take a leisurely stroll along Fisherman's Wharf, then step aboard SS Jeremiah O'Brien, and finally get to know the fascinating history of Filbert Steps. Get ready for a full day of sightseeing on the next day: take some stellar pictures from Twin Peaks, look for all kinds of wild species at Strawberry Hill, then admire the majestic nature at Marin Headlands, and finally take in the views from Golden Gate Bridge. To see other places to visit, more things to do, where to stay, and other tourist information, read our San Francisco online route planner . Hobart, Australia to San Francisco is an approximately 19.5-hour flight. You can also do a combination of flight and train. The time zone difference moving from Australian Eastern Standard Time (Tasmania) (AEST) to Pacific Standard Time (PST) is minus 18 hours. November in San Francisco sees daily highs of 20°C and lows of 12°C at night. Cap off your sightseeing on the 15th (Fri) early enough to travel to Hilton Head. On the 16th (Sat), enjoy the sand and surf at Driessen Beach Park, look for all kinds of wild species at Islanders Beach Park, and then explore and take pictures at Mitchelville Freedom Park. To find reviews, where to stay, photos, and other tourist information, read our Hilton Head day trip planning website . Traveling by flight from San Francisco to Hilton Head takes 10 hours. Alternatively, you can do a combination of flight and bus; or drive. The time zone difference when traveling from San Francisco to Hilton Head is 3 hours. Expect a daytime high around 23°C in November, and nighttime lows around 12°C. Cap off your sightseeing on the 16th (Sat) early enough to travel to Naples. Naples is a city in Collier County, Florida, United States. Step out of the city life by going to Shark Valley and Keewaydin Island. Your itinerary includes some good beach time at Ten Thousand Islands National Wildlife Refuge and South Marco Beach. Venture out of the city with trips to Englewood (Englewood Beach & Stump Pass Beach State Park), Stand-Up Paddleboarding (in Bonita Springs) and Big Cypress National Preserve (in Ochopee). Next up on the itinerary: cast your line with a fishing tour, steep yourself in history at Smallwood Store, take in the architecture and atmosphere at Celebration Community Beach Church, and learn about winemaking at The Naples Winery. To find more things to do, traveler tips, other places to visit, and other tourist information, refer to the Naples road trip planning tool . You can do a combination of flight and bus from Hilton Head to Naples in 8.5 hours. Alternatively, you can do a combination of bus and flight; or drive. In November, Naples is somewhat warmer than Hilton Head - with highs of 32°C and lows of 21°C. Finish your sightseeing early on the 21st (Thu) to allow enough time to travel to Key West. Discover out-of-the-way places like Fishing Charters & Tours and Kayaking & Canoeing. 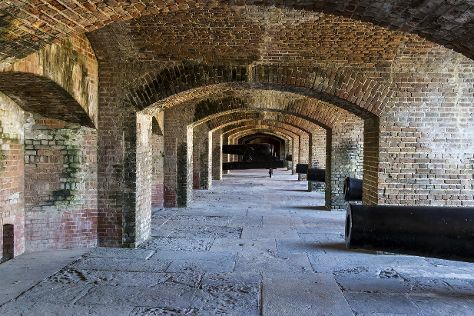 Your cultural itinerary includes sights like Fort Zachary Taylor and Key West Cemetery. And it doesn't end there: visit a coastal fixture at Key West Lighthouse and Keeper's Quarters Museum, find your balance on the water with some of the best stand-up paddleboarding in the area, soothe aching muscles at some of the top local wellness centers, and pause for some serene contemplation at St. Paul's Episcopal Church. To see traveler tips, ratings, where to stay, and more tourist information, you can read our Key West road trip planning tool . Getting from Naples to Key West by ferry takes about 3 hours. Other options: drive; or take a bus. Traveling from Naples in November, Key West is somewhat warmer at night with lows of 26°C. Wrap up your sightseeing on the 25th (Mon) to allow time to travel to New York City. Get outdoors at Edwin B. Forsythe National Wildlife Refuge and Edgar Felix Memorial Bikeway. Explore hidden gems such as Quogue Wildlife Refuge and High Point Cross Country Ski Center. Explore New York City's surroundings by going to Shawangunk Mountains (in Woodstock), High Point State Park (in Sussex) and Ponquogue Beach (in Hampton Bays). There's still lots to do: admire the majestic nature at Minnewaska State Park Preserve and hunt for treasures at Chelsea Market. To find maps, other places to visit, ratings, and other tourist information, read New York City online tour itinerary planner . Do a combination of flight and bus from Key West to New York City in 6 hours. Alternatively, you can fly; or drive. Traveling from Key West in November, things will get cooler in New York City: highs are around 16°C and lows about 7°C. Finish up your sightseeing early on the 30th (Sat) so you can travel to Portland. Start off your visit on the 30th (Sat): identify plant and animal life at Maine Wildlife Park, identify plant and animal life at Wells Reserve at Laudholm, and then visit a coastal fixture at Portland Breakwater Lighthouse. Get ready for a full day of sightseeing on the 1st (Sun): make a trip to Doubling Point Lighthouse and then enjoy the sand and surf at Reid State Park. For reviews, ratings, where to stay, and more tourist information, read Portland trip planner . Getting from New York City to Portland by flight takes about 4.5 hours. Other options: fly; or drive. Traveling from New York City in November, expect Portland to be little chillier, temps between 11°C and -1°C. Finish up your sightseeing early on the 1st (Sun) so you can travel to Moab. Escape the urban bustle at Arches National Park and Turret Arch. Gallery Moab LCA and Tom Till Gallery are good opportunities to explore the local culture. 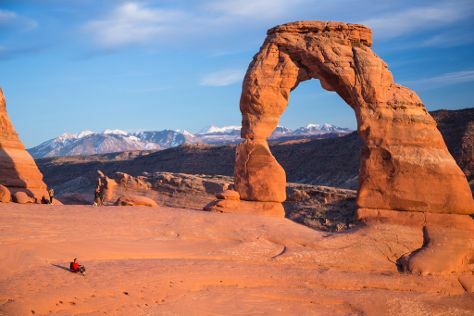 You'll find plenty of places to visit near Moab: Arches National Park (Double O Arch, Sand Dune Arch, & more) and Canyonlands National Park (Shafer Trail, Upheaval Dome, & more). There's still lots to do: take your sightseeing to a higher altitude at Double Down Bike Shop, admire the verdant scenery at Castle Valley, examine the collection at Moab Museum of Film and Western Heritage, and look for gifts at Moab Rock Shop. Do a combination of flight and car from Portland to Moab in 11 hours. Alternatively, you can do a combination of bus, flight, and car; or drive. You'll gain 2 hours traveling from Portland to Moab due to the time zone difference. Traveling from Portland in December, you can expect nighttime temperatures to be little chillier in Moab, with lows of -11°C. Finish up your sightseeing early on the 6th (Fri) so you can go by car to Page. 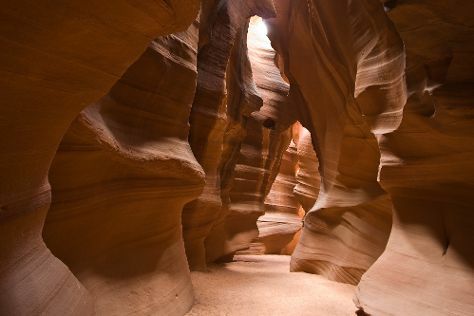 Explore hidden gems such as Antelope Canyon and Lees Ferry. Get outdoors at Glen Canyon National Recreation Area and Lone Rock Beach. Change things up with a short trip to Navajo National Monument in Shonto (about 1h 30 min away). There's still lots to do: explore the stunning scenery at The Chains, explore and take pictures at Rainbow Bridge National Monument, and explore the striking landscape at Horseshoe Bend. Planning Page trip won't be overwheling when you use's Insprock itinerary maker. Getting from Moab to Page by car takes about 5 hours. Other options: do a combination of car, bus, and shuttle. Expect a bit warmer temperatures when traveling from Moab in December; daily highs in Page reach 9°C and lows reach -1°C. Cap off your sightseeing on the 9th (Mon) early enough to go by car to Grand Canyon National Park. Visiting Grand Canyon South Rim and North Kaibab Trail will get you outdoors. You'll explore the less-touristy side of things at South Kaibab Trail and Yavapai Point. On the 11th (Wed), hike the day away at Bright Angel Trail. And it doesn't end there: tour the pleasant surroundings at Rim Trail, get great views at Lookout Studio, trek along Hermit Trail, and admire the striking features of Grand Canyon Railway Depot. To see other places to visit, photos, more things to do, and other tourist information, use the Grand Canyon National Park trip itinerary builder website . You can drive from Page to Grand Canyon National Park in 2.5 hours. Traveling from Page in December, plan for slightly colder nights in Grand Canyon National Park, with lows around -11°C. Wrap up your sightseeing on the 14th (Sat) early enough to drive to Sedona. Step off the beaten path and head to Montezuma Well and Jerome State Historic Park. Popular historic sites such as Riordan Mansion State Historic Park and Whiskey Row are in your itinerary. Explore Sedona's surroundings by going to Jerome (Cellar 433 & Holy Family Church) and Yavapai County Courthouse Square (in Prescott). Next up on the itinerary: contemplate in the serene atmosphere at Amitabha Stupa & Peace Park, explore the ancient world of Palatki Ruins, wander the streets of Historic Old Town Cottonwood, and learn about winemaking at Page Springs Cellars. To see more things to do, where to stay, ratings, and other tourist information, you can read our Sedona online trip builder . Drive from Grand Canyon National Park to Sedona in 2.5 hours. While traveling from Grand Canyon National Park, expect a bit warmer days and much warmer nights in Sedona, ranging from highs of 14°C to lows of 3°C. Finish your sightseeing early on the 18th (Wed) to allow enough time to travel to Kailua-Kona. Relax by the water at Mauna Kea Beach and 49 Black Sand Beach. Step out of the city life by going to Dolphin & Whale Watching and Scuba & Snorkeling. Venture out of the city with trips to Hawaii Volcanoes National Park (Volcano Art Center & Kīlauea) and The Painted Church (in Captain Cook). There's lots more to do: get a dose of the wild on a nature and wildlife tour, enjoy the sand and surf at Kahaluu Beach, admire all the interesting features of Kealakekua Bay, and take in the architecture and atmosphere at St. Michael the Archangel Church. To find traveler tips, other places to visit, maps, and tourist information, refer to the Kailua-Kona trip maker website . You can do a combination of shuttle and flight from Sedona to Kailua-Kona in 12 hours. Alternatively, you can fly; or do a combination of taxi and flight. You'll gain 3 hours traveling from Sedona to Kailua-Kona due to the time zone difference. Traveling from Sedona in December, expect Kailua-Kona to be much hotter, temps between 32°C and 24°C. Cap off your sightseeing on the 23rd (Mon) early enough to travel to Lahaina. Do some cultural sightseeing at Maria Lanakila Catholic Church and Lahaina United Methodist Church. Step out of the city life by going to Kahekili Beach Park and Ho'okipa Beach Park. You'll find plenty of places to visit near Lahaina: Kihei (Kamaole Beach Park III & Stand-Up Paddleboarding). The adventure continues: tour the pleasant surroundings at Kapalua Beach, glide through the air with a parasailing or paragliding tour, let the river carry you with a rafting and tubing tour, and steep yourself in history at Old Lahaina Courthouse. Plan my trip to Lahaina with suggested itineraries provided by Inspirock. Traveling by flight from Kailua-Kona to Lahaina takes 4 hours. Alternatively, you can do a combination of flight and bus; or do a combination of bus and flight. December in Lahaina sees daily highs of 30°C and lows of 23°C at night. Finish your sightseeing early on the 27th (Fri) so you can travel to Honolulu. Your inner history buff will appreciate USS Arizona Memorial and National Memorial Cemetery of the Pacific. Do some cultural sightseeing at Makapuu Lighthouse Trail and Saint Augustine by-the-Sea. Explore Honolulu's surroundings by going to Kailua (Kailua Beach Park & Lanikai Beach) and Haleiwa (Waimea Valley & Scuba & Snorkeling). There's much more to do: tour the pleasant surroundings at Waikiki Beach, trek along Koko Crater Railway Trail, see the vivid underwater world at Pele's Chair, and enjoy the sand and surf at Kapiolani Regional Park. Before you visit Honolulu, use our trip planner to discover what you can do and see there. Traveling by flight from Lahaina to Honolulu takes 3.5 hours. Alternatively, you can do a combination of ferry and flight; or do a combination of bus and flight. In December, daily temperatures in Honolulu can reach 32°C, while at night they dip to 24°C. Wrap up your sightseeing by early afternoon on the 1st (Wed) to allow time for travel back home.